Mother Nature in all her glory deserves our utmost respect and admiration. She manages to create feats of wonder and beauty that the human imagination can only hope to imitate, never duplicate. And one of her most impressive areas of expertise is not cherry blossoms, not autumn foliage, not gloriously multicolored volcanic mountain lakes, not even the elegant crane or the delicate chrysanthemum. While these are all greatly admired and accepted symbols of Japan, Mother Nature far outdoes herself when it comes to bugs. A friend was once working for an American company that sold breakfast cereal. The company had the brilliant idea of cutting costs by removing the plastic bag and putting the cereal directly into the box. My friend vetoed that idea in no uncertain terms: not only would Japan’s humidity turn the delicate, crunchy flakes into gooey, sticky mush, it was virtually guaranteed that multi legged creatures would find their way into those selfsame boxes and make themselves at home. And they’re not shy about breeding, either. Just imagine. You’re still half asleep, girding your loins for the nightmare that is Tokyo morning rush hour. You open the box, shake it over a bowl, and out tumbles a multi-generational family of winged creatures along with their offspring. The nightmare begins before you even put your shoes on. While you are writhing on the floor desperately trying to erase the image from your mind, Edgar Allen Poe and Stephen King link arms and dance a jig. I once attempted to go upstairs and was greeted by a large black winged thing with a huge blue head clinging to the wall. Perhaps it was an acid flashback, but just to be safe, I opened the front door and returned to the living room, hoping he would make himself scarce. He did, and I never saw him again. For this I am grateful. But sometimes Mother Nature has a sense of humor. On the way to lunch today, I came across this guy. 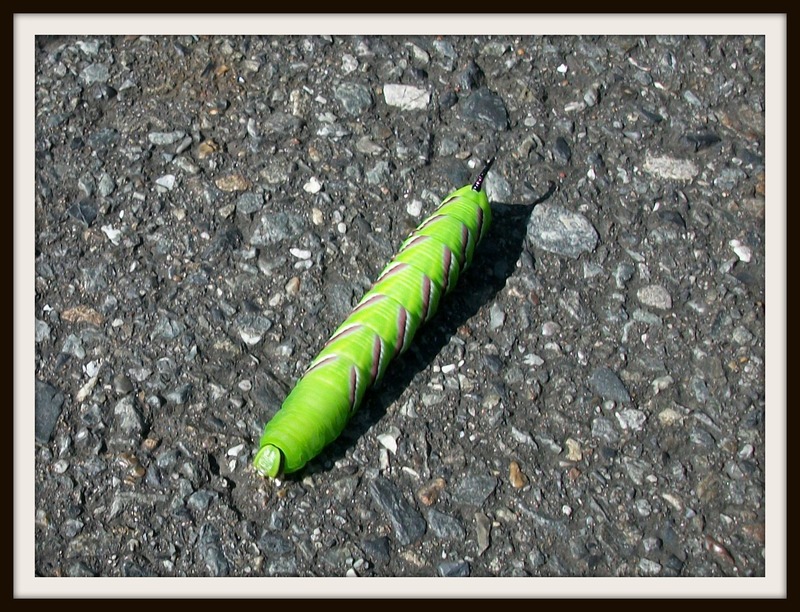 A good four inches long, at first I thought he was a plastic toy some kid had dropped, but then I looked closer. He was moving, moseying his way across the street toward some flowerpots. I was fascinated. I’ve come across worms and caterpillars of all sorts in Japan, but had never seen one quite like this one. I did a Google search for “green segmented caterpillar” and apparently this one doesn’t exist, at least according to Google, although there are plenty of other variations, most of which are nowhere near as cute as this little guy. Go on. Google it. I dare you. I hope he made it to wherever he was going. I had a look on the way home and didn’t find any green slime smeared on the asphalt. I’m stumped as to why he was in the middle of the street in the first place. Wouldn’t he have been more comfortable under a bush or crawling up a tree trunk or nestled in a box of Corn Flakes?